Some companies put on The Messiah for Christmas. Bootless Stageworks, always marching to its own drummer, is putting on Not the Messiah (He’s A Very Naughty Boy), an Oratorio by Eric Idle and John DuPrez, based on Monty Python's Life of Brian, in late January. We had the opportunity to sit in on an early rehearsal for the show, conducted by Bootless Music Director James W. Fuerst and featuring two dozen singers from Bootless, NewArk Chorale and other area theater companies as well as 20 orchestra musicians from Bootless, Wilmington Community Orchestra, Newark Symphony, Diamond State Concert Band, First State Symphonic, Chesapeake Brass Band and University of Delaware Orchestra. Everyone involved in this fundraising production is doing it on a volunteer basis, and the enthusiasm for the piece shows through. You may remember soloists Geoff Bruen, Kimberly Christie, Cynthia Ballentine, and Michael Popovsky from Bootless' 2012 production of Jerry Springer: The Opera (among other area Opera Productions), and Justin Walsh from the always-popular Evil Dead: The Musical. That so many talented folks have come out to donate their time is a testament to both the appeal of Not the Messiah and the small theater company that has not been without its struggles in the past couple of years. About a year ago, it looked like Bootless, a nomadic "pop up" theater company, had found a permanent home in Newport, Delaware. The location had one major problem: it lacked a parking lot, and the company couldn't get the go-ahead to build one. Homeless again, Bootless struck a deal with OperaDelaware to utilize its Black Box theater, but scheduling conflicts with that space's longtime resident, City Theater Company, have prevented it from becoming its permanent home (though Bootless' next show, Venus in Furs, will be performed there in March). For Not the Messiah, the company is utilizing one of Wilmington's best kept secrets: the Down's Cultural Arts Center at Ingleside Retirement Apartments, located at 1005 North Franklin Street. "It's a great deal for non-profit organizations," says Bootless Executive and Artistic Director, Rosanne DellAversano. "It's free to use for non-profits. They're working to bring programs to the venue, where a percentage of tickets go to the residents." In addition to enriching the lives of the residents, the venue is open to the public. 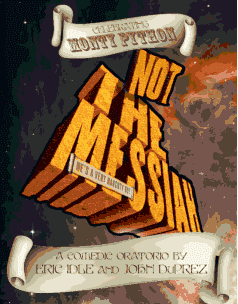 Not the Messiah will have just two shows, on Friday January 31, and Saturday February 1. Both shows will be at 7:30 pm. Tickets for are $25 General Admission, $20 for Seniors and Military, and $18 for Students, and include complimentary refreshments at intermission. All proceeds will benefit Bootless Artworks. To purchase tickets, and for more information about Bootless, go to bootless.org.